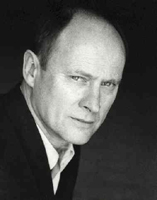 Patrick Malahide has had a distinguished stage career in both classical and contemporary drama. His films include Captain’s Corelli’s Mandolin, Billy Elliot and The World Is Not Enough, but he is probably best known for his television roles in Goodbye Mr Chips, The Singing Detective and Middlemarch. Tom Oakley, an elderly countryman living alone after the death of his wife and child, is known as ‘ a grumpy old man’ to the locals. And he’s none too pleased when in 1939, at the start of the last war, he has a nine-year-old London evacuee named Willie landed on him. But it is a move that will change both their lives. 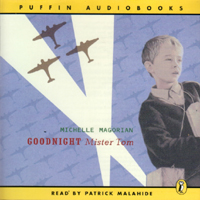 Michelle Magorian’s Goodnight Mister Tom won the 1981 Guardian Children’s Fiction Prize. The first of a ten-part story, set during the Blitz, by Michelle Magorian. David Brierley has appeared in many television programmes but is most notable for being the voice of the robot dog K-9 during the 1979-80 season of the BBC Science Fiction series Doctor Who.